Work continues on implementing Goblins. While that’s going on, we’re also doing some things that have been on our todo list for some time – adding wardogs and changing the armor mechanics. In addition, Paul is doing a makeover of many of the older assets in the game, especially the Battle Brothers themselves. That’s right, wardogs have made their way into the game and you can soon have them in your mercenary company. These dogs are of a large and aggressive breed and they come with their own name and one of several different looks. But what is their purpose? Goblins will rely heavily on ranged combat and kiting their opponents, so Battle Brothers need a new trick up their sleeves as well. And while the recently introduced feature of retreating enemies does alleviate the issue of having to catch the last remaining enemies, we want to go further. Wardogs are a tool for the player to chase down any enemy and hold them in place until Battle Brothers arrive, as well as to find any enemies hidden in the fog of war. It’s a tool that makes a lot of sense in a medieval fantasy world, and at the same time is something to have fun with and get invested in. Afterall, who doesn’t like dogs? Wardogs are not individual characters in your party but are treated like an item – at least outside of combat. They can be bought in settlements and then assigned to a character before combat. Ever noticed that empty slot in the top left of your characters’ paper doll? That’s the accessory slot, and that’s where wardogs go, among other things. In combat the character handling a dog has a unique skill called ‘Unleash Wardog’. 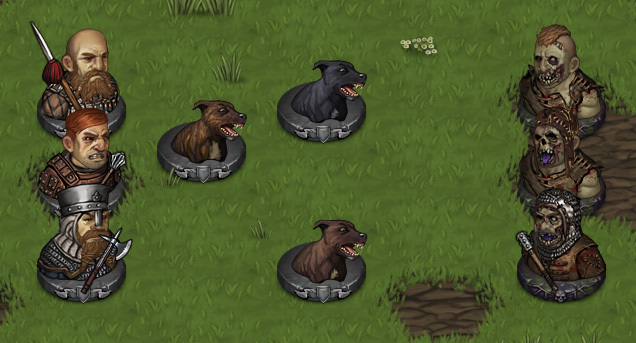 The unleashed dog will spawn on an adjacent free tile and will act immediately after the handler has finished his turn. The dog is not controlled by the player but by the AI following a distinct behavior – it will straight up charge for the next free opponent and engage him in melee all while doing a lot of barking. Wardogs don’t actually do that much damage, at least not against armored opponents, but they are very useful in pinning down archers or other elusive targets in the opponent’s backline for your Battle Brothers to follow up. What’s more, they can track down hidden enemies. If you don’t know where the last few enemies are hiding on the map, unleash a dog and he will find them for you. Wardogs bring a lot of utility to the table, but they also require a bit of careful thinking of when to best be unleashed. They’re not humans and so will run happily into enemy spears only to kill themselves. Just like for your Battle Brothers that spells perma-death for them. First, the punchline: We’ve changed how weapons and armor interact. While we believe that the armor system as it was worked decently well, there were a couple of issues we want to address with this change. Because armor effectively acts as additional hitpoints, the game as it were encourages stacking a lot of armor. In fact, it encourages doing so over increasing hitpoints because raising maximum fatigue in order to wear more armor yields more effective hitpoints than raising actual hitpoints on levelup. In addition, getting hit with any kind of weapon and just shrugging off the damage as long as your armor is intact is a simplistic approach. In reality you often suffer at least some small bruise or blunt trauma, even if your armor is not penetrated. Finally, we have no way of correctly modelling weapons that penetrate armor very well without doing much damage to the armor itself. A good example is the crossbow which has a very high armor efficiency causing it to do a lot of damage against armor because we had no other good way of modelling penetrating attacks. Firstly, armor damage is applied to armor (if any) based on the ‘Armor Effectiveness’ of the skill and weapon used. Secondly, and this is new, ‘Direct Damage’ is applied to hitpoints based on the skill used but reduced by 10% of the current armor value. This means that the better the armor, the less direct damage gets through, and the more damaged an armor gets, the more direct damage will get through. Finally, if there is no armor left, the remaining damage is applied directly to hitpoints. So how does that address the issues above? With direct damage, both armor and hitpoints matter. A character getting attacked by weapons that can inflict a lot of direct damage – such as crossbows or maces – can now get killed even while he has armor points left. On the other hand, a character can never get killed with any hitpoints left. Because hitpoints heal a lot slower than armor is repaired or replaced, Battle Brothers may also take attritional damage now by way of cuts and bruises that add up over several battles, further emphasizing the need for a larger hitpoint pool for longer campaigns. With the introduction of direct damage we can now correctly model weapons like crossbows that were built to penetrate armor, not to destroy it. This also gives us a more freedom for introducing different skills and weapons in the future. Finally, modeling most attacks as inflicting at least some damage to the target in the form of blunt trauma, concussion or bruises is arguably more realistic than assuming that armor would prevent all damage. While unfortunately this added mechanic does take away a bit from the clear and simple way it worked previously we’re confident that this is well worth the trade-off. We want to strike a good balance between having realism in our combat system and keeping the mechanics easy to pick up, and we feel that the concept of direct damage makes a lot of sense intuitively. As you may know, we started out doing this game in our free time, in the few hours we had each evening after our day jobs. With very limited time we had to make some tough calls and couldn’t give everything the attention we wanted to. This changed since we moved to working fulltime on the game about a month ago, and this also shows in the game’s visuals. The newer assets – such as for the upcoming Goblins – are a lot more detailed, making the older assets look a bit dated by comparison. To remedy this, Paul will be revamping many of the older assets and giving them a makeover so that they’re on par with the new stuff for a consistently detailed look. First up are the Battle Brothers themselves – and while we’re at it, we’re also adding a few more faces, hair and beard styles as well! The new armor system sounds interesting. Not too complex imo. Perhaps new players can learn from a short ingame tutorial later. Glad you Made wardogs possibly for players. Does this enable wardogs for bandits well? I’ll try it out as soon as I can! right now the bandits do not use wardogs but why not? That’s alright, I’ve still a lot of other stuff on my plate anyways, haha. Just keep up the good work. See you on the next update. Step to more complicated game. Мm… for me – is good. Of course, we will need to understand exactly how and how logical and playable it will be in the update, but the essence and direction are clear to me. I agree with Jago – manual ( preferably simple and clear) – will not be superfluous. Nice to see, that you have not forgotten the promise about dogs. 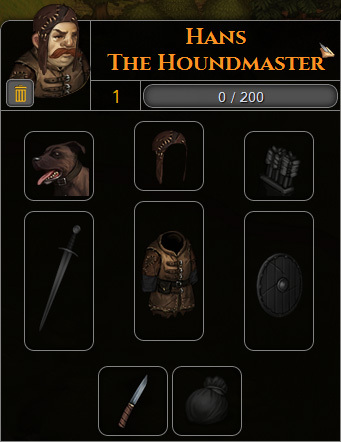 I think, different breeds of fighting dogs will not take long.Suppose also that the change of work mechanics of armor will entail the revision and the increase in the skill tree and hope that the new mechanics of damage calculation would work for the player and enemies alike :) Thanks for the detailed information and hard work. All their opaly about graphical improvements I have already stated in the Paul’s topic. Hitpoints are now useful,of course,But with leveling up HP + melee attack + melee defence + sometimes fatigue instead of HP there would be much harder to get heavy armor…. I think new armor mechanics is more intuitive than what we have now (you have to break through armor in order to start dealing damage). I am looking forward to see how this will change combat. I used armor piercing weapons as means to expose enemies to higher damage dealing ones (for example: crossbowmen stripped armored enemies and allowed bowmen to get higher damage overall). I guess bows might take a hit, unless their piercing power will remain good enough to keep them a viable choice in late game. I like the changes to the armor mechanics. It seems pretty intuitive, and it clears up a very mild annoyance for me. It always bothered me just a little that even lightly wounded Brothers had their armor totally trashed at the end of a fight. I think the changes nicely address the issue. And what mercenary company worth its salt doesn’t have some good guard dogs? Fantastic work, guys. Keep it up! inline images, how do they work?